I’ve never really stopped long enough to really go into the nitty-gritty of what fear is and how it plays an important part of my life. Until now. As I begin my expedition into the Light-Yes Land of fear I first need to center myself around the fact that fear is a necessary and important part of life, it is not something to be skirted around or denied but an emotional tool to be used. Having come to that conclusion the next part of the expedition is to reconcile Jesus’ instruction (bordering on a commandment) not to be afraid. In light of many instances when Jesus said not to be afraid and because I believe fear is a necessary that means there’s an imaginary line dividing fear as a positive experience and fear as a negative experience. I believe Jesus defined the line in the Sermon on the Mount when he said, “So don’t worry about tomorrow, for tomorrow will bring its own worries. Today’s trouble is enough for today.” (Matthew 6:34, emphasis added) I understand Jesus to be saying, “Once fear has taken on the identity of worry you have crossed the border into the “Light-Less land” of negativity. Before going further I need to clarify the use of “Light-Less” rather than using the word dark. On the surface it may appear as if I am just making a play on words but I am not. For me there is a huge difference from living “Light-Less” and living in the dark. “Jesus spoke to the people once more and said, “I am the light of the world. If you follow Me, you won’t have to walk in darkness, because you will have the light that leads to life.” (John 8:12) Light has a permanency about it whereas darkness is only temporary. When it is dark out there still is light it is only shining somewhere else and eventually life will go from dark to light. Jesus will never leave those who believe and trust him, “…And be sure of this: I am with you always, even to the end of the age.” (Matthew 28:20) However, when it is Light-Less there is no light therefore since there is no hope, the danger of a Light-Less world originates from the fact that one can be bathed in the brightest light and still live in a Light-Less world. Today I find myself facing a dilemma, in the last sentence of Matthew 6:34 Jesus tells us (commands us) in the first sentence not the cross the line into the Light-Less land of negativity (worry) of tomorrow but then turns around and says, “Today’s trouble is enough for today.” Does that mean it’s not okay to worry about what will happen tomorrow but its okay to worry about what will happen today? Although on the surface that may appear to be the case but the truth is as long as we don’t stray across the border into the Light-Less land even though it appears as if we are walking in the dark the Son will yet shine again. Continuing on the Journey of Fear, as long as we’re on the “Light-Yes” side of fear we’ve no need to worry and fear becomes a positive experience that keep the light of hope illuminated. My biggest fear is crossing the border into the Light-Less land of negativity (living without Jesus) while I’ve been standing right at the border many times with the powers of the Light-Less land tugging at me faith and the Holy Spirit hold me on this side of the border. Years ago, we’d tied our dog Hobo to a clothesline so she could run back and forth but her chain put limits on how far she could get away. At first rabbits refused to come into the yard to eat grass but eventually they discovered Hobo could only go so far and started coming back into the yard. When we heard Hobo barking we could look out the window see rabbits eating grass with Hobo barking at the end of her chain. That experience reminds me my own life and the border between the Light-Yes land and the Light-Less land. Psalms 27 begins by asking a question, “The LORD is my light and my salvation–so why should I be afraid?” At first the answer seems simple – if the LORD is my light and salvation then there’s no need to be afraid. And I agree but there are times when life is not as simple as it appears. I say that because we don’t live in a perfect world there are times when fear comes calling on me. As I stated earlier fear is a part of our lives. Several weeks ago after heavy exertion I experienced chest pain and couldn’t catch my breath worried I was having another heart attack Patti drove me to my doctor who sent me to the ER where I spent the weekend in the hospital. Turns out my worries were unfounded, rather than a heart attack I was suffering from an angina and tachycardia. 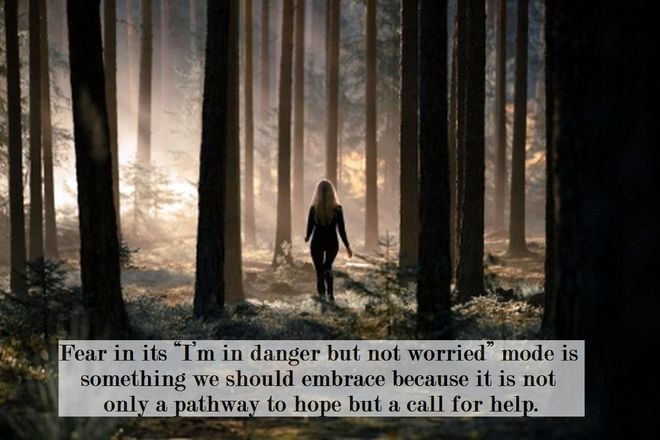 Fear in its “I’m in danger but not worried” mode is something we should embrace because it is not only a pathway to hope but a call for help. The fear I experienced that sent me to the doctor then to the ER had its beginning in November of 2013 when I did suffer a heart attack. Turning back the clock to November 4, 2013 had I not reacted positively to the fear of having a heart attack I might not be here today. “And we know that God causes everything to work together for the good of those who love God and are called according to His purpose for them.” (Romans 8:28, emphasis mine) I may be walking on a slippery slope right now but that is where want to because as far as I am concerned when Paul used the word everything he meant everything including fear as long as we do not cross the border into the Light-Less Land. One last thought about our Journey in the Light-Yes Land perhaps this expedition into the Light-Yes Land of fear has been on a slippery slope because fear comes with a great deal of negative baggage. After a while it becomes hard to understand fear can be a useful “tool” in combating those experiences that pull us from the Light-Yes Land into the Light-Less land. About half an hour ago after helping Patti pick up the house I began experiencing a sharp pain just underneath my breastbone before I even had a chance process the telltale signs of the fear of a heart attack I silently whispered, “You’ve got this don’t you Jesus?” I never heard a word from him but the signs of fear and a heart attack slowly faded away.